Bo’s person left him with a friend about six or so months ago, and the friend took him to a shelter before Christmas. Friend, indeed! Bo, a Golden Retriever, was suddenly homeless. For lack of space at the shelter, he was kept in a small crate and soon developed an abscess on his tail. He couldn’t leave it alone, and the abscess became infected. Before it was treated, he had almost chewed his tail off. About this time, Jennafer at Rowdy Rescue in Slaughters, KY, pulled him from the shelter and took him to a veterinarian. The tail was in such bad shape it had to be amputated. Now all he had left of his beautiful tail was a nub. When he had recovered from his surgery, Jennafer posted his information on the Rowdy Rescue pet list on Petfinder. 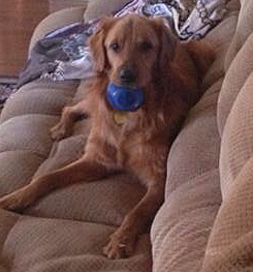 Across the border in Clarksville, TN, Kathy and Jason Mattern had lost their 13-year-old Golden Retriever. They were heartbroken because he had been with them for so long and had grown up with their children. Now he was gone and there was a hole in their lives. They decided to adopt another Golden. “They are such awesome family dogs,” Kathy says. At first they went directly to a breed specific rescue group, but didn’t find a match. Then they looked on Petfinder and found Bo at Rowdy Rescue, which shelters an assortment of small and medium-sized dogs. It was a golden moment for Bo and the Matterns, and Bo now has a forever home.